In the frequently asked section, you can typically find an answer to almost any question you may have for our office. We’ve composed detailed questions that clients have asked in the past for certain things and grouped them into categories. This makes finding a solution much easier than digging around our website. If you still do not find an answer to your question, you may fill out the form below or feel free to give us a call or email. Our contact information is located here. BOTOX® Cosmetic is a simple, nonsurgical, physician-administered treatment that can temporarily smooth moderate to severe frown lines, forehead wrinkles, and crows feet. It is the only treatment of its type approved by the Food and Drug Administration (FDA). BOTOX® Cosmetic: What causes frown lines between the brows? The lines that appear between your brows actually result from muscle movement and the passage of time. Two muscles are largely responsible for frown lines between the brows. When those muscles contract they draw the brows together. As the skin becomes less elastic over time, repeated frowning can result in those moderate to severe lines between the brows. BOTOX® Cosmetic: What are the common side effects? The most common side effect is minimal bruising. BOTOX® Cosmetic: How does it work? Frown lines are caused by overactive facial muscles. BOTOX® Cosmetic is intramuscular, blocking the chemicals that cause facial muscles to contract, thereby relaxing them. BOTOX® Cosmetic: What is treatment like? BOTOX® Cosmetic is a quick and minimally invasive procedure. No anesthesia is required, although you may choose to numb the area with numbing cream prior to your visit. Dr. Kandula makes a few tiny injections into the muscles that cause the frown lines. The entire procedure takes approximately 10 minutes, and there is no downtime afterward. Discomfort is minimal and brief. BOTOX® Cosmetic: How soon will I see a difference? You can expect to see results within days after your treatment. The appearance of the area between your brows may continue to improve for up to two weeks after treatments. BOTOX® Cosmetic: What kind of results can I expect? Your own results will vary – be sure to talk to Dr. Kandula about what you can expect. Visible results have been shown to last up to 4 months, and after that you may be ready for a follow-up treatment. Juvéderm™ is smooth gel filler injected under your skin to instantly smooth out those wrinkles and folds. Juvéderm™ injectable gel is used most effectively for those wrinkles and folds in the lower third of your face, like your “laugh lines,” “smile lines” or “parentheses” (nasolabial folds), or “marionette lines” (oral commissures). Juvéderm™: How does it work? Juvéderm™ is a “next-generation” filler. It is made from hyaluronic acid—a naturally occurring substance in your skin that helps to hydrate and add volume. Hyaluronic acid may diminish with age, contributing to the formation of wrinkles and folds. Juvéderm™ injectable gel works to correct this by restoring hyaluronic acid in your skin, helping to smooth wrinkles and folds. Juvéderm™: What is treatment like? Although anesthesia is not required, you may use numbing cream on the area to be treated. Dr. Kandula eases Juvéderm™ under the skin using a fine needle to fill the soft tissue of the dermis—the dense inner layer of skin beneath the epidermis—to add volume and diminish wrinkles and folds. Following the injection, Dr. Kandula may gently massage the treated areas. The procedure is quick and easy and usually takes only about 15 minutes. Prior to your procedure, you should refrain from taking aspirin, ibuprofin, napersin and other aspirin dirivities for at least 5-7 days. Also, Vitamin E and blood thinners should also be avoided. Arnica taken orally can help minimize bruising. Arnica can be found at your local nutrition store. Juvéderm™: What are the common side effects? After the treatment, some temporary injection-related reactions may occur, including redness, pain, firmness, swelling, and bumps. Studies have shown that these are usually mild to moderate in nature and clear up on their own in 7 days or less. If you experience swelling at the injection site, you can apply an ice pack for a brief period. Juvéderm™: How soon will I see a difference? What kind of results can I expect? You should see an immediate improvement in the treatment areas. Most patients need one treatment to achieve optimal wrinkle smoothing, and the results last up to 6 months or more. However, results may vary and correction is temporary. Supplemental “touch up” treatments may be required to achieve and maintain optimal results. Restylane is an injectable gel that can be administered by Dr. Kandula. Restylane enhances your natural looks by restoring your skin’s volume, creating softness and revitalizing your appearance. Restylane®: What are the benefits? Restylane® can instantly soften telltale aging lines or improve your looks by enhancing your natural features, such as your cheeks or lips. Restylane® restores volume, improves skin elasticity, and smooths lines and imperfections. Restylane® is long lasting but not permanent. Restylane®: How does it work? Restylane® is a crystal-clear gel produced biotechnologically using stabilized, nonanimal hyaluronic acid and water. The hyaluronic acid is a tissue-friendly substance closely resembling the hyaluronic acid that occurs naturally in the body. By replenishing nature’s supply of hyaluronic acid, Restylane® revitalizes and plumps up the skin, instantly diminishing the appearance of lines and giving a softer look. Restylane®: What is treatment like? Restylane® is injected into the skin in small amounts using a very fine needle. The gel provides hydration and structure and gives natural volume to smooth away the appearance of lines, enhance facial shape, or create fuller lips. Some people may experience the treatment as a mild discomfort. A local anesthetic cream is often used. The treatment is very quick and often takes less than 30 minutes. No skin test is required because Restylane does not contain any animal-derived ingredients. However, 5-7 days prior to your procedure, you should refrain from taking aspirin, ibuprofin, napersin and other aspirin dirivities. Vitamin E and blood thinners should also be avoided. Arnica taken orally can help minimize bruising. Arnica can be found at your local nutrition store. Restylane®: What areas can be treated? Restylane®: What are the common side effects? Some common injection-related reactions might occur after a Restylane® injection; they typically resolve spontaneously within one or two days after injection. These reactions include redness, swelling, pain, itching, bruising or tenderness at the injection site. Inflammatory reactions may last for up to two weeks in rare cases. After a lip enhancement, your lips may be swollen for several days. Restylane®: How soon will I see a difference? The treatment benefits can normally be seen instantly and Restylane® does not affect facial expression. Restylane®: What kind of results can I expect? The effects of Restylane® are long lasting but not permanent. Duration depends on many factors, such as skin type, lifestyle, age, the degree of perfection demanded by the patient. Belotero Balance® is a hyaluronic acid injectable filler designed to integrate into facial skin tissue. The unique manufacturing process for Belotero Balance® yields a soft and cohesive gel that, once injected, instantly fills the skin to help smooth moderate-to-severe etched-in lines and wrinkles. While the product is versatile enough to handle moderate nasolabial folds (smile lines around the mouth), it may be an ideal option for treating delicate areas such as etched-in smile lines and vertical lip lines (thin lines that appear above and around the lips). Immediately upon treatment, Belotero Balance® helps smooth etched-in lines and wrinkles, such as vertical lip lines above and around your lips. Belotero Balance® is made of a substance called hyaluronic acid (HA)1, a natural component of skin. HA binds to water, making it an ideal product for correcting wrinkles and folds, as it binds with the skin’s own water. The HA in Belotero Baance® is specially formulated in a proprietary process to create a uniquely smooth and cohesive gel.5 This injectable gel blends into the natural structure of your skin, gently filling etched-in lines and wrinkles and creating a smooth, natural look and feel. Belotero Balance® is FDA approved and has undergone testing in a clinical study to demonstrate its safety. Hyaluronic acid products for wrinkle correction have been available for a long time and used in thousands of treatments. Just like any injection, you may experience mild irritation, swelling, itching, redness, bruising, or tenderness at the injection site. These side effects typically resolve on their own. If any of these side effects persist for more than 7 days, contact your healthcare provider immediately. Ultherapy® is a safe, non-surgical ultrasound treatment that counteracts the effects of time and gravity on your skin. Ultherapy® uses the body’s own regenerative response to gently and gradually lift skin on the eyebrow, under the chin and on the neck, and smooth lines and wrinkles on the décolletage. What is unique about Ultherapy®? Ultherapy® is the only non-invasive treatment cleared by the FDA to actually lift skin. Ultherapy® is also the only cosmetic procedure to use ultrasound imaging, which allows practitioners to see the layers of tissue targeted during the treatment to ensure the energy is deposited to where it will be most beneficial. With the addition of the new Ultherapy® Décolletage Treatment, Ultherapy® is also now the only non-invasive procedure specifically indicated by the FDA to improve lines and wrinkles on the chest. Can Ultherapy® replace a face lift? Ultherapy® treats the deep foundational layer addressed in cosmetic surgery, but won’t duplicate the results of a facelift. Ultherapy® is a great alternative, however, especially for those not ready for surgery or for patients looking to extend the effects of cosmetic surgery. How is Ultherapy® different from laser treatments? 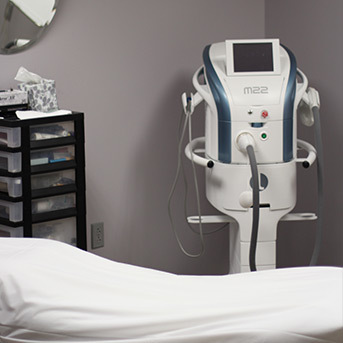 Ultherapy® uses sound energy – tried-and-true ultrasound – which has unique properties that allow it to bypass the surface of the skin to treat depths not matched by any other non-invasive cosmetic device. Ultherapy® ultrasound stimulates collagen production in the skin’s foundation, resulting in a clinically significant lift of tissue over 2-3 months. Lasers rely on light energy, which cannot reach deeper skin layers at an optimal temperature, so laser treatments typically only treat superficial skin and are not FDA-cleared to lift skin. Since the two technologies often treat different types of skin issues, they’re actually very compatible. With Ultherapy®, there is no downtime. After your procedure, you can resume your normal activities immediately, without having to follow any special post-treatment measures. The skin might appear flushed at first, but the redness should disappear within a few hours. Some patients experience slight swelling, tingling or tenderness to the touch, but these are temporary in nature. Other, less common post-procedural effects may include temporary bruising or numbness on small areas of skin. As with any medical procedure, there is the possibility for other rare effects, which your practitioner will review with you. Click here for full product and safety information. What is the Liposonix® Treatment? The Liposonix® treatment uses non-invasive, high-intensity focused ultrasound to get rid of fat around your waistline (abdomen and love handles) without surgery. Results are typically seen in 8 to 12 weeks. How does the Liposonix® treatment work? High-intensity ultrasound energy is focused on the targeted fat. Skin is not damaged as targeted fat beneath the skin is destroyed by the ultrasound energy. The body naturally removes the destroyed fat from the treatment area, which may leave you with a thinner, more contoured waistline. How is the Liposonix® treatment different from other fat reduction products/procedures? Unlike some other fat reduction procedures that often require multiple treatments to see results, with the Liposonix® treatment, you can reduce your waistline by an average of 1 inch (2.5 cm), or about one dress or pant size, with a single one-hour treatment. Office visit time and individual results may vary. Results are typically seen in 8 to 12 weeks. A Liposonix® treatment of the abdomen and love handles is completed in about one hour. Office visit time may vary. Your healthcare professional can give you a better estimate after evaluating you. How Does StarLux® Fractional Skin Resurfacing System Work? The Palomar Lux1540 fractional laser hand piece delivers light in an array a narrow, focused “microbeams,” to create columns of coagulation (heat) within the skin. The heated tissue within the columns initiates a natural healing process that forms new, healthy tissue. This results in a fresher, more youthful skin tone and texture. StarLux® Fractional Skin Resurfacing: What areas can I have treated? StarLux fractional treatments can be applied to most areas of the body, including the face, chest, arms, and hands. StarLux® Fractional Skin Resurfacing: What is treatment like? By delivering light as individual pulses of microbeams, the Lux1540 protects the skin from the overheating that can result the other resurfacing treatments. In addition, the Lux1540 features built-in cooling of the skin, so you feel only minor discomfort during the treatment. Additionally, ical anesthetic, such as a numbing cream, may be used for additional comfort. StarLux® Fractional Skin Resurfacing: What should I expect after treatment? You may experience redness, wants, swelling, or tightness in the treated area, which typically fades within in a few hours of treatment. The skin may often have a pinkish hue for 5-7 days. Generally, you can receive a treatment and go back to work or to other activities without any recovery time. Because the light pulses are confined to narrow columns in the skin, much of the skin is left unaffected and there is a quick healing process. Most people notice positive changes in skin tone and texture within a few days. A series of treatments at 3-6 week intervals may be required to achieve the desired results. Palomar RejuveLux™ Photofacial: How does it work? The Palomar RejuveLux™ handpiece emits pulses of light into the skin. The light is absorbed by the pigment in the sunspots and the blood in visible vessels, and converted to heat. The heat dissolves the cells that create the pigment and shrinks the vessels. Palomar RejuveLux™ Photofacial: What areas can be treated? Any area, except directly around the eyes. The face, neck, chest, arms, back and legs can all be treated. Palomar RejuveLux™ Photofacial: What conditions can be treated? Sun damage, sunspots, rosacea and spider veins can all be treated with the Palomar RejuveLux™ Photofacial. Palomar RejuveLux™ Photofacial: What is treatment like? Dr. Kandula will move the handpiece over your skin, pulsing it all the while. Each pulse will send a beam of light through your skin. A flashing light, an audible tone and a mild sensation on the skin will tell you when the handpiece is being pulsed. A ical anesthetic, such as a numbing cream, may be used for additional comfort. Palomar RejuveLux™ Photofacial: What kind of results can I expect? Immediately after treatment, you can expect a mild sunburn-like sensation, possibly accompanied by some minor swelling. This usually lasts 2-24 hours, and can be soothed with a cold gel or ice pack. Typically, several treatments will be necessary to achieve complete clearance of sunspots, rosacea and vessels. Sunspots/Sun Damage: The sunspots will darken after treatment and be naturally shed from the skin within 1-2 weeks. Rosacea: Skin tone will be more normal, with less pronounced redness within a week after treatment. Spider Veins: Vessels may disappear after treatment or they may appear darker and then fully or partially fade within 10-14 days.